Brock Edward Lesnar is an American professional wrestler, actor and mixed martial artist. 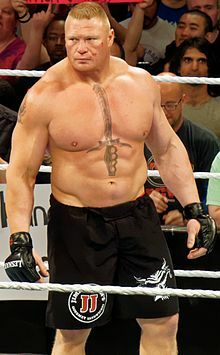 Lesnar wrestled professionally for World Wrestling Entertainment from 2002 to 2004. When he was in the WWE, he won the WWE Championship three times, the King of the Ring tournament in 2002 and the Royal Rumble in 2003. He left the WWE in 2004 and travelled to Japan to wrestle for New Japan Pro Wrestling. While in Japan he won the IWGP Heavyweight Championship. Lesnar retired from professional wrestling to pursue a career in the UFC. Lesnar made his return to WWE on April 2, 2012, delivering his finishing move the F5 to John Cena. He began a feud with Triple H and faced him at SummerSlam on August 19, 2012 and won by submission and broke Triple H's arm. He released a tout and said that he was quitting the WWE because he had conquered everything in the WWE. He returned to the WWE again on January 28, 2013 and delivered an F5 to Vince McMahon as McMahon was about to fire Paul Heyman. The F5 resulted in McMahon's pelvis breaking. He fought in the UFC from 2008 to 2011, winning the UFC Heavyweight Championship before retiring from the UFC after losing his last match against Alistair Overeem at UFC 141. This page was last changed on 16 October 2018, at 05:32.